The increasing demand of mobile applications in everyday processes is an ever increasing trend – also in the security industry, this need is felt. These include but are not limited to access to cameras, intercoms or switching contacts. MIDAS, as cross-platform solution, delivers the interface between internal processes and the mobile terminal of an employee . Currently smartphones, tablets, smart watches and desktop PC’s can be involved in the process and securely managed centrally. In the case of loss or theft of a device, it can be locked remotely. The displayed data can be made from almost any third system. 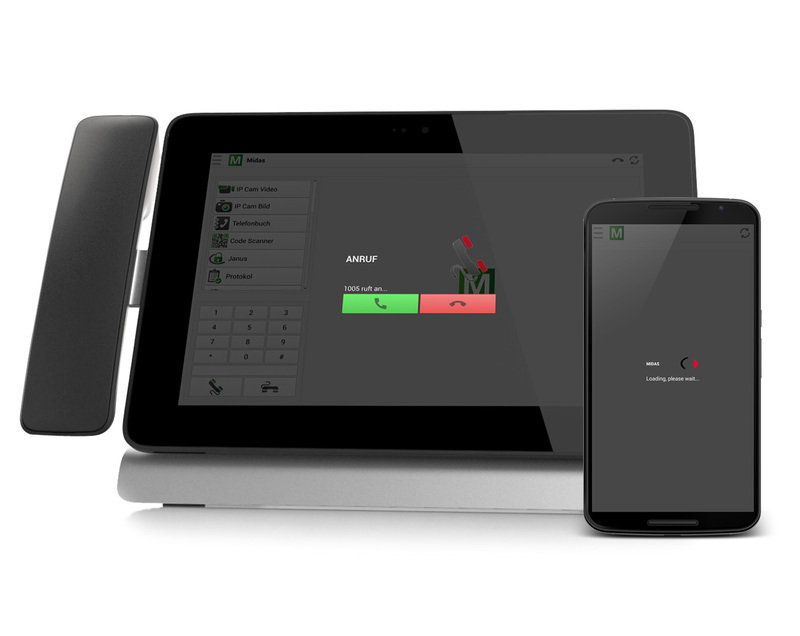 Based on the »Metasec Mobile Frame«, MIDAS is available as a complete SIP Intercom Station application. Wether on Android™, iOS™, Windows™, Linux™ or MAC™ – thanks to our future oriented cross-platform development, Midas supports nearly any operating system. MIDAS is also available for all popular desktop client operating systems like Windows, MAC or Unix based distributions. In the simplest case, as software for realizing a video call station for door communication, there are many more possible functions. A graphical phonebook with search feature and Free / Busy indicator is also part of the repertoire as well as the opportunity to access different camera streams during a call. The Free / Busy visualization also allows the possiblity of so called »concierge« functions to be implemented. In this case, the participants can be placed and displayed on building maps or site plans. 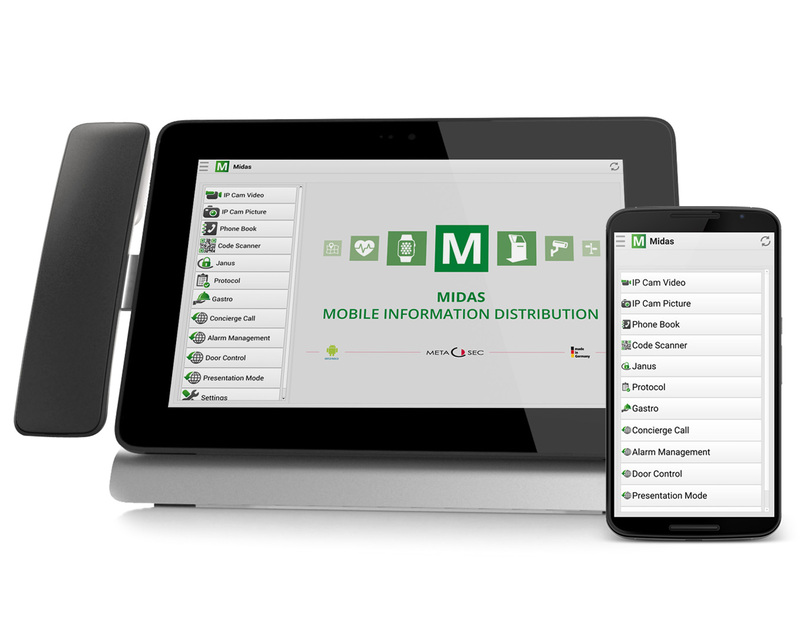 Another highlight of the MIDAS application is the ability to display presentations and alarms on the devices. Thus, the MIDAS devices may be used as information terminals or – in an emergency – to transform dynamic escape routes ads; all controlled centrally from the server. By the use of tablets which already offer a variety of network technologies, MIDAS is connectable both in-house network and via WAN or UMTS to a central station. Rounding out the concept is the possibility of centralized management and monitoring of the MIDAS units – once configured initially, the rest of the configuration is done on the server side.